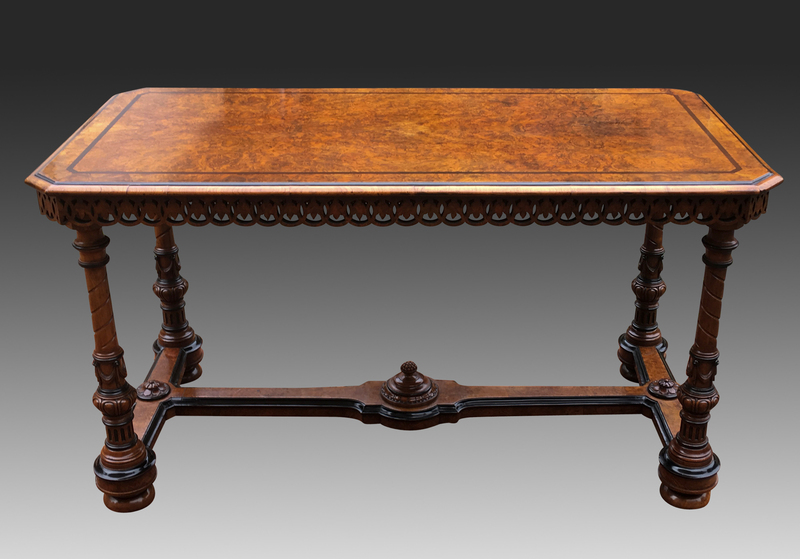 *This stunning quality antique table was made in the late 19th century by cabinet makers T.H. Filmer. The rectangular top has a beautiful burr and figured book matched veneers. It has canted corners and an ebonies band inlaid two inches from the bulls nose moulded edge. 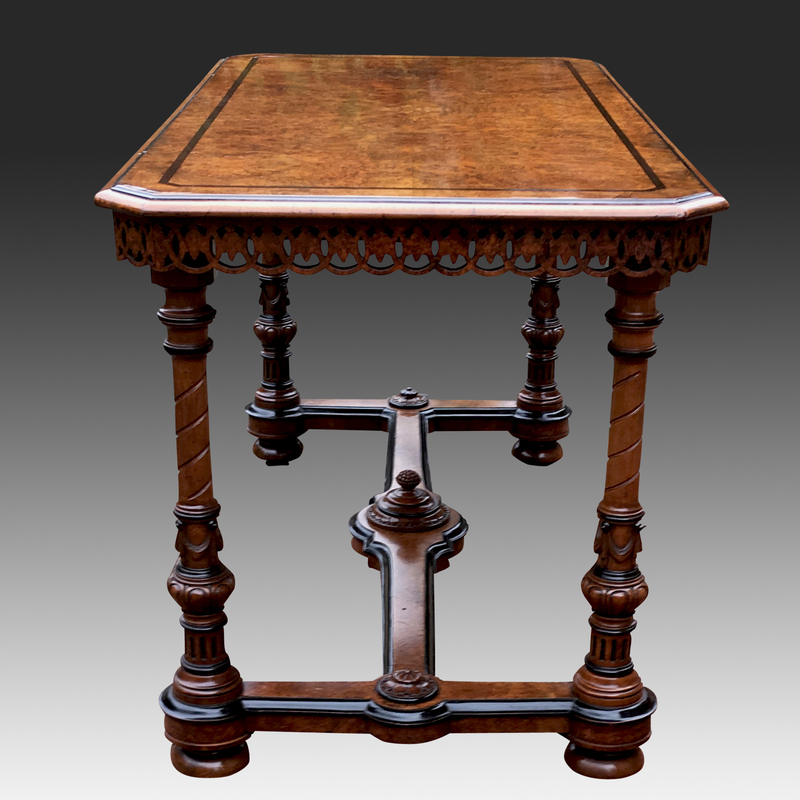 The table stands on four turned, carved and part ebonies legs. These are joined by an H stretcher with a beautifully carved finial in the centre. 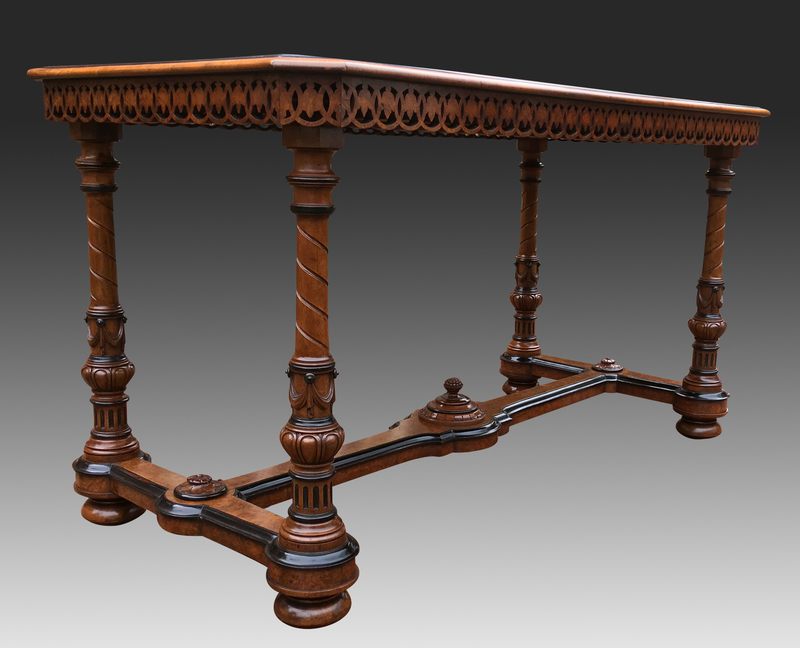 If you are interested in this Antique Burr and Carved Walnut Library Table please contact us quoting reference: SN772. 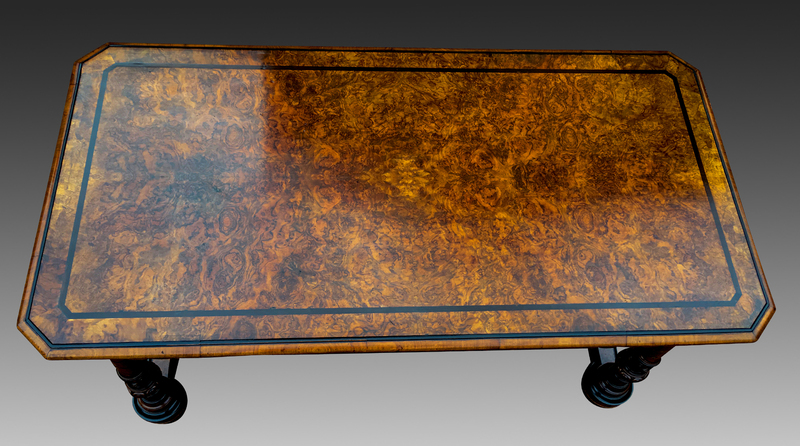 This stunning quality antique table was made in the late 19th century by cabinet makers T.H. Filmer. The rectangular top has a beautiful burr and figured book matched veneers. It has canted corners and an ebonies band inlaid two inches from the bulls nose moulded edge. 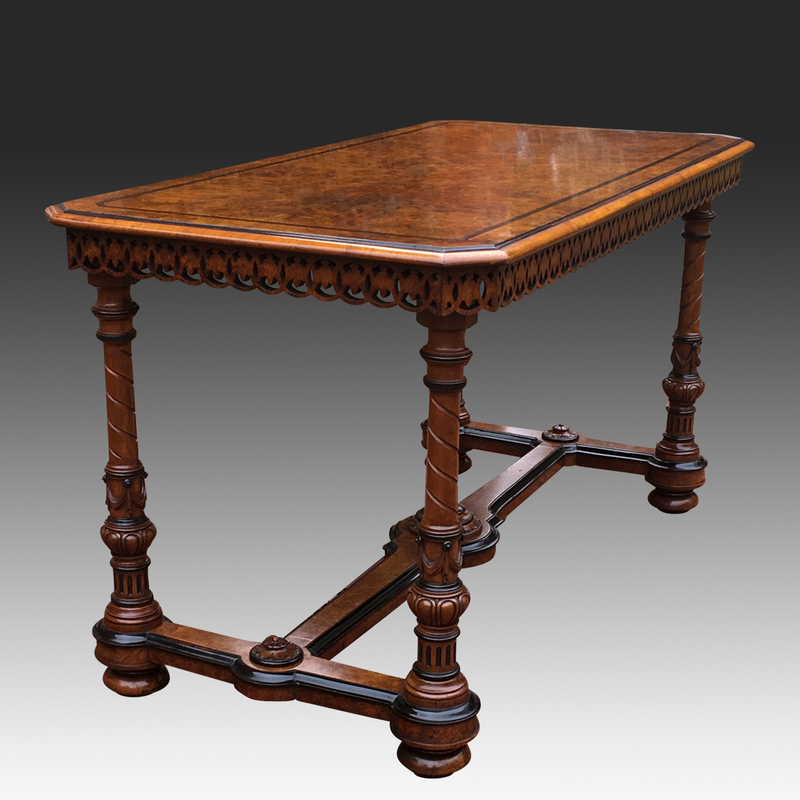 The table stands on four turned, carved and part ebonies legs. These are joined by an H stretcher with a beautifully carved finial in the centre. 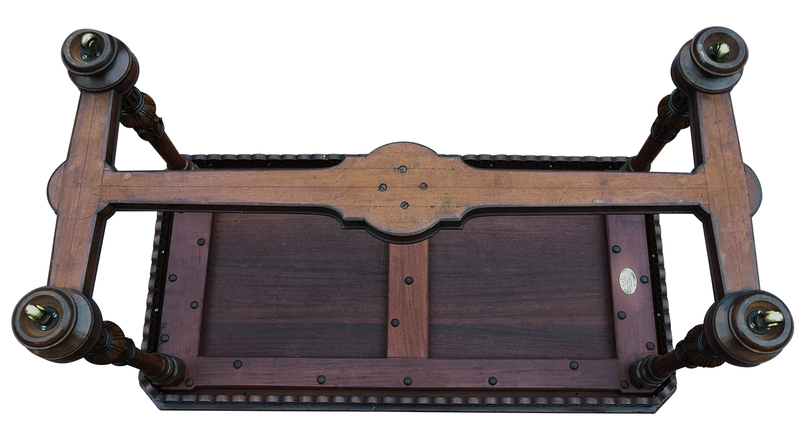 The table stands on bun feet with the original hidden castors. 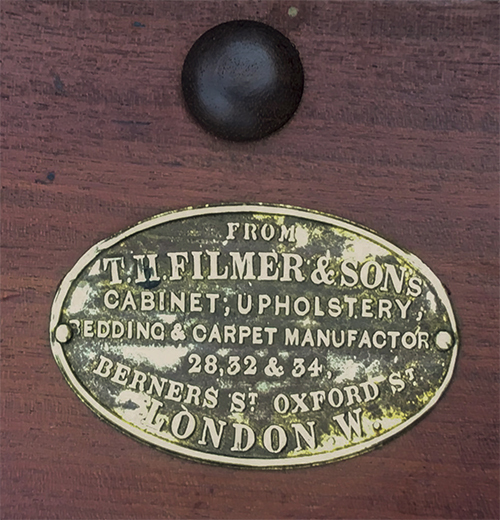 The carving and general manufacture is of top quality and beneath the top is original brass cabinet makers trade mark for T. H. Filmer. They had a reputation for making some of the finest quality furniture in the mid 19th century. The firm was located at 34 Berners Street, London from 1835 and exhibited at the international trade exhibitions of the period. An example of their work is the teapoy in the antique furniture collection of the Victoria and Albert Museum. This eye catching antique table could be used as a desk, library table or as a focal point in any room as it is a truly stunning piece of furniture. This table is in superb condition having been cleaned and wax polished it is ready to grace any home or work place.